I thought Chris Thompson looked much better today but he needs to have a good game against Tampa Bay without fumbling to have a shot at making the team IMO. Well I liked the pick. He gets to top speed in two steps, unlike anyone on the team except maybe Moss. He has the team's best jump stop in the open field and that's a plus in the return game. 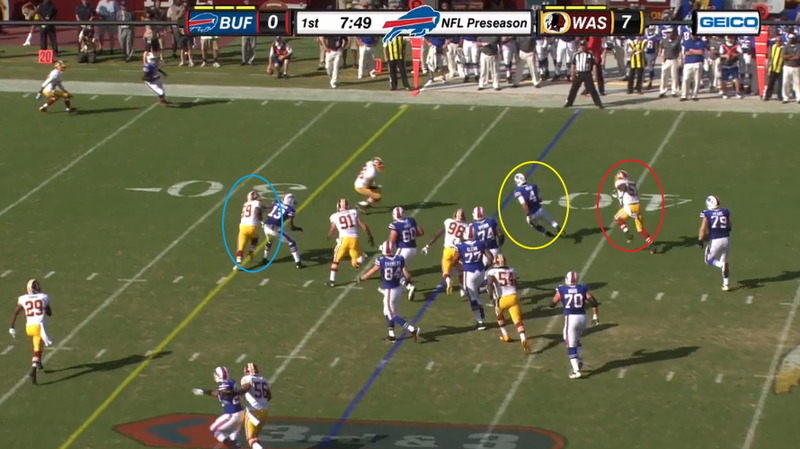 Maybe Hall and Moss are just as good as punt returners, but you don't risk them back there unless you're desperate. And I think he has potential to be a better KO returner than Paul, maybe the best RB receiver out of the backfield. The two fumbles are a concern and he holds the ball too far out when going down. But that's coachable. He's got something that no other RB on the team has, home run potential. My impression is that he runs straight into tacklers and doesn't (yet) understand how to set up blocks or use cut-back lanes in this offense. His body isn't strong enough to withstand direct NFL hits consistently, and he doesn't shift to deflect the full force of contact. His ability to cut laterally isn't very useful in the offense, but rather in the open field (such as as a PR). He doesn't hold the ball with both hands at point of contact, which will cause fumbles. He has raw talent but needs a year to learn how to run in this offense, IMO. As a PR he may be dangerous but may make more negative plays (fumbles) than big returns. He could be great in a year or two. He needs to understand how to run in this offense, and then his natural speed and agility will help him. 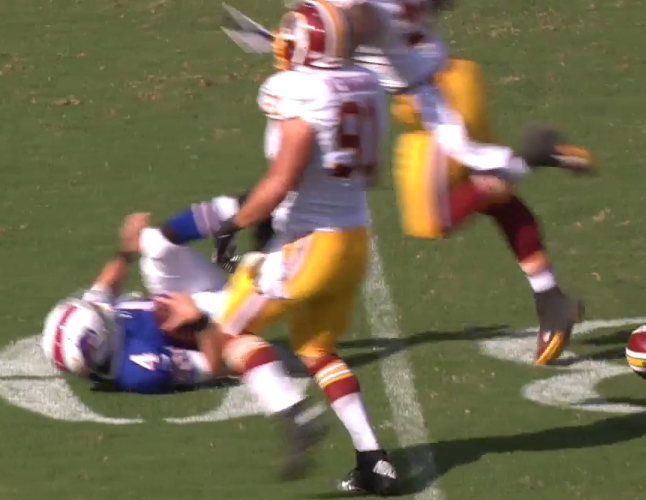 But he may accumulate injuries if he doesn't learn to avoid the full force of contact, which Morris does well. Morris isn't quick, but he's very shifty and powerful. 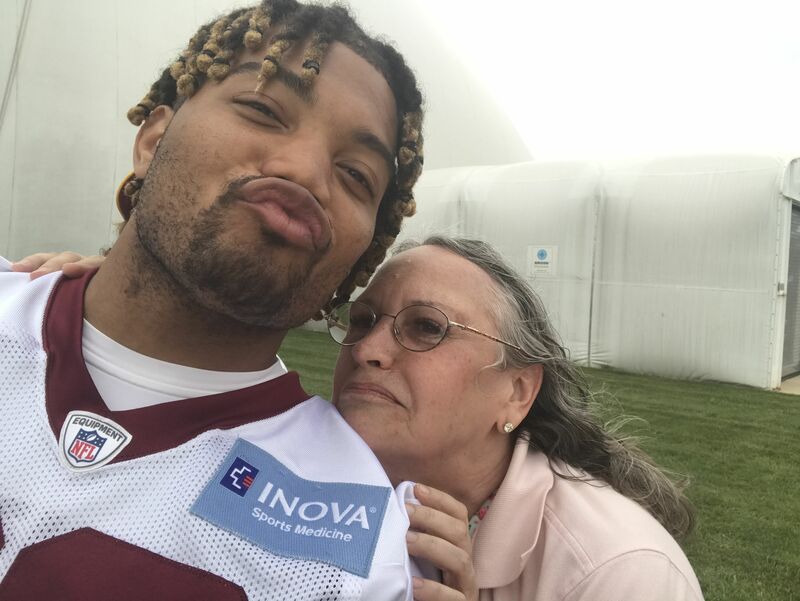 I can't undertand all the Keiland Williams love, either. However I do admit he is our 4th quarter player of the preseason. Thompson was drafted for his explosive upside and after today (his performance and Crawf going down) he makes it as the 4th RB and PR. Its obvious he's still not quite 100% yet and has alot to learn but his upside is the key, and I can't wait to see him when he is 100%. I saw Thompson make some nice cuts, hit the hole hard. The final stats don't look so hot but didn't he have a lot of goal line carries late? Those tend to deflate rushing #s since a lot of those carries only go for like 2-3 yards tops and he's clearly not a goal line back. He has potential, at least enough to keep around as a 3rd back. I doubt we can get away with PS-ing him. I had a bunch of stuff goin' on today and couldn't watch. I heard the O looked pretty good. How did the rookies in the secondary look? Like rookies. Some good, some bad, some really bad. Although Rambo did a better job for the most part in tackling, but Amearson got beat a couple of times and had a bad penalty! Rambo looked much improved over the last two weeks. Amerson took a step back. 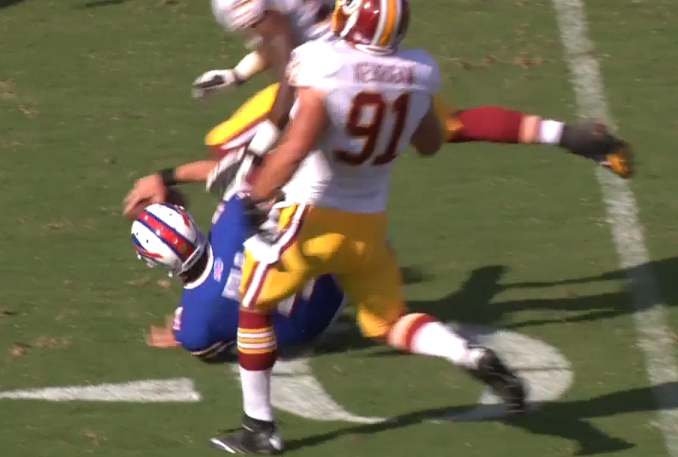 His facemask penalty was an absolute killer. 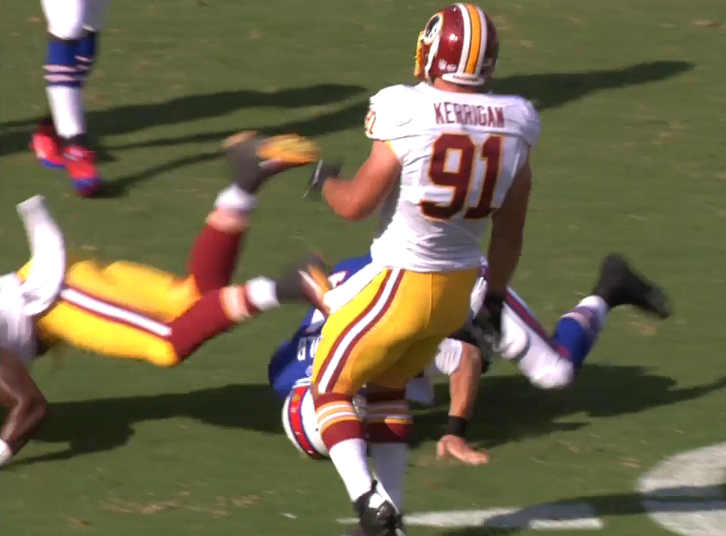 Didn't even need to do it, there were two other guys there to help him secure the tackle. And it was on 3rd down too, and the Bills went on to score. He also got beat deep quite often. Disappointing to see. How? They had 63 yards through the air? 2? In addition to a face-mask? Its just rookie mistakes Sire, once he failed to turn around when the ball came over his shoulder towards the receiver and just plowed into TJ Graham. He'll be ok, bound to be some growing pains. No doubt. I liked David's open field tackle against the Steelers and enjoyed watching him waving his arms to get the crowd involved. He'll be an all-pro FS in this league, though we need him at corner right now. Thompson needs to be on the PS imho. Maybe he's not 100% like PC said but That's the reason I thought he was a baffling pick to begin with. He does have a great skill set but nothing Helu doesn't offer imho. The real question is what's up with Jamison? Jamison is either remaining a secret so he squeaks on the PS or he's not showing much behind our other guys (PS is my guess). So I guess the burning question is who makes it on the final 53 @ RB? and who is cut/ps bound? also should be mentioned that our "first ladies" looked smokin hot today on the sidelines from the camera shots I seen. I went back to look at this play again. It's actually a late hit by #57 rookie Brandon Jenkins, who was chasing Kolb prior to the shoestring tackle by Fletcher, on Kolb's scramble for 8 yards on 3rd and 5. 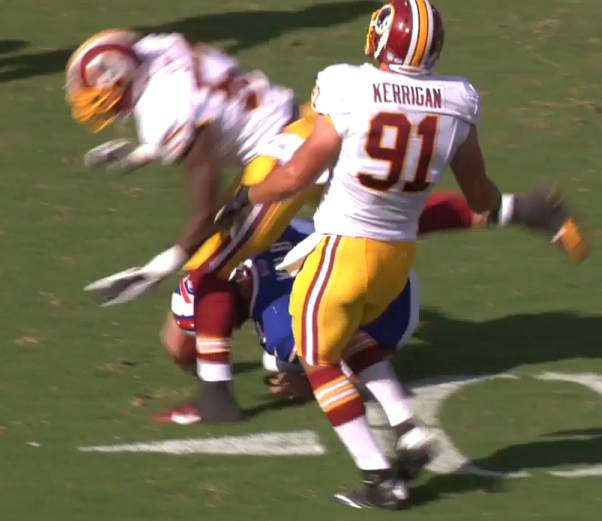 The late hit is clearly unintentional, as Jenkins was trying to vault over Kolb after Fletcher took Kolb down. Kolb rolled and was in the process of raising his head to stand up when Jenkins vaulted him, driving his upper shin into the rear of Kolb's helmet and thereby driving Kolb's helmet into the turf. So, there were two shocks, the hit to the back of the head and then the hit of the helmet to the turf. 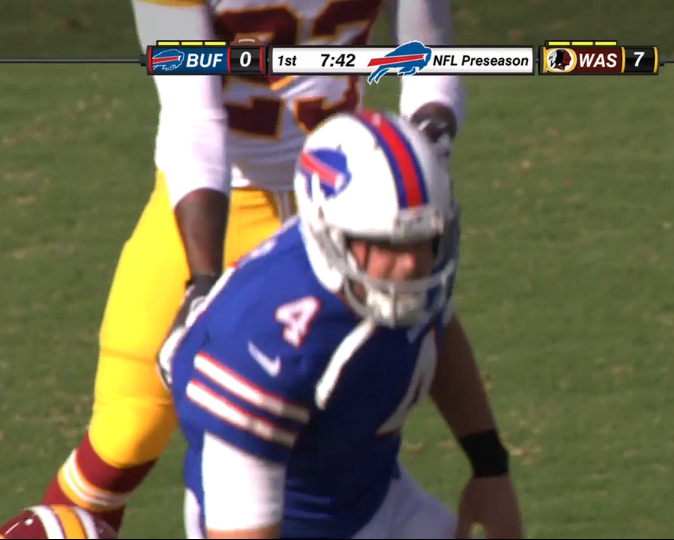 I am outlining this in depth because this might end up being Kolb's last NFL hit. He's had too many concussions and is an ineffective QB. If he has any brains left, he should retire. He has money and his life ahead of him. Quit now. That is actually quite nice work ASF. 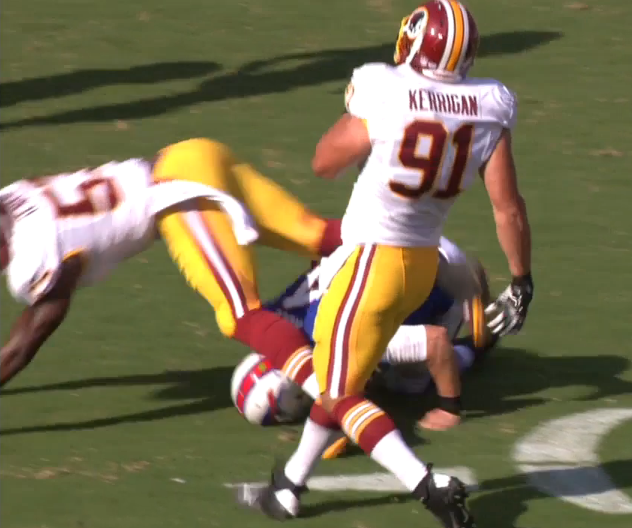 And yea, from those stills, I can see "concussion like symptoms" happening for sure. I think Thompson "could" be a good punt returner. I am just worried that he hasn't had enough time to work at the craft and therefore may make some bad errors/turnovers. They should get Brian Mitchell to work with him. Actually, I don't believe Brian Mitchell had much time fielding punts until camp of his rookie season. They can give Thompson a crash course over the next couple weeks. Some players are naturals.